Patsy Ruth “Pat” Fowler was born September 2, 1933 in Van, Texas to James Herbert & Opal (Holland) Brown. She and her late husband, Neill, had lived in Madison County since 1962. 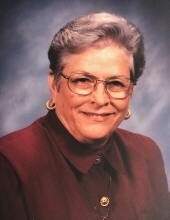 Pat worked in the tax office of the Madisonville Consolidated Independent School District for about ten years before becoming a bank teller for Farmers State Bank in Madisonville. Pat enjoyed reading, crocheting and loved “gadgets.” Additionally, she loved that her family had made so many wonderful memories during various camping trips. Window shopping with her daughters was similarly, a favorite past time of Pat’s. Most of all, Pat loved her many grandchildren and great grandchildren. She especially treasured her many photos of them that she had accumulated. Pat passed away July 29, 2018 in Bryan, Texas at the age of 84 years. She was preceded in death by both of her parents; beloved husband, Neill Fowler and grandson, Kevin Hendrix. Surviving family members include daughters, Lynn King (Lynn) of Bryan and Lea Hendrix (Eric) of Yukon, OK; sister, Jerry Ann Clark of Ft. Smith, AR; grandchildren, Reece Dunn (Jessica), Angie Guidry (Lee), Wes Dunn, Matt Dunn (Jennifer), Jamie Dunn (Courtney), Kalyn Estrada (Alex) and Erica Hendrix and great grandchildren, Trinity Dunn, Kendall Dunn, Lyndie Dunn, Kaden Dunn, Maddie Guidry, Nathan Guidry, Luke Dunn, Claire Dunn, Katelynn Dunn, Jett Dunn, Xavier Estrada, Sophia Estrada, Aurora Estrada, Kevin Estrada and Bowie Dunn. Pat is also survived by nieces, Shanon Small of Heavener, OK and Robin Newton of Euless and nephew, Russell “Rusty” Clark of Heavener, OK.
Funeral services for Pat will be held at 10 A.M., Thursday, August 2, 2018 at the Madisonville Funeral Home in Madisonville, Texas. Rev. Lee Guidry will officiate the service. Interment will follow in the Madisonville Cemetery. A public visitation will take place Wednesday, August 1st from 6 P.M. to 8 P.M. at the funeral home. Pallbearers: Reece Dunn, Wes Dunn, Matt Dunn, Jamie Dunn, Alex Estrada, Lee Guidry, Eric Hendrix, Lynn King. To send flowers or a remembrance gift to the family of Patsy Ruth "Pat" Fowler, please visit our Tribute Store. "Email Address" would like to share the life celebration of Patsy Ruth "Pat" Fowler. Click on the "link" to go to share a favorite memory or leave a condolence message for the family.